A stent is an innovative development in treating a carotid artery stenosis, which is a narrowing or blockage. Click on the video clip below to see how a stent is implanted to treat a carotid artery stenosis. Q. What is carotid artery stenosis ? The carotid arteries are the arteries located on both sides of your neck that direct blood to the face and brain from the heart. A stenosis is a narrowing of the carotid arteries, due to a buildup of plaque. Q. What dangers does a stenosis present ? A stenosis can cause a stroke or a TIA (transient ischemic attack). For information on strokes and TIAs,. Plaque buildup can reduce the flow of blood and oxygen to the brain and cause a stroke. Also, if not treated, a narrowing of the artery can turn into a complete blockage, preventing any blood or oxygen from getting to the brain at all. When the carotid arteries become blocked, symptoms may include dizziness, confusion, drowsiness, headache, and/or a brief loss of ability to speak or move. These symptoms may indicate early warning signs of a possible stroke. Another concern is that plaque particles or blood clots that form around the plaque, can break off and travel to the brain, also causing a stroke. Q. What causes plaque buildup and strokes ? 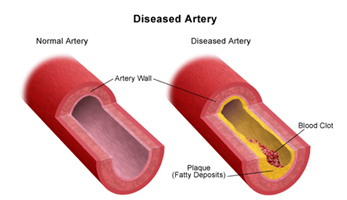 Your lifestyle or family history can increase your risk for carotid artery disease. Smoking, obesity, a diagnosis of high blood cholesterol, diabetes or hypertension, or a family history of atherosclerosis can increase your risk of carotid artery disease. Awareness is important in reducing stroke deaths. The single biggest thing a person can do to decrease risk is not smoke. Don't ever start, or if you smoke, quit now. Arterial plaques that contribute to stroke risk occur naturally with age, which is why stroke occurs most often in older persons. But among smokers, our surgeons have performed corrective surgery for patients as young as the mid-30s. Q. How are carotid blockages diagnosed ? carotid artery duplex scan (also called a doppler or blood flow study) : - a noninvasive diagnostic procedure that uses two modes of ultrasound - Doppler and B-mode. The B-mode transducer (like a microphone) obtains an image of the carotid artery being studied. The Doppler probe within the transducer evaluates the velocity and direction of blood flow in the vessel. A transducer sends out ultrasonic sound waves at a frequency too high to be heard. When the transducer is placed on the carotid arteries at certain locations and angles, the ultrasonic sound waves move through the skin and other body tissues to the blood vessels, where the waves echo off of the blood cells. The transducer picks up the reflected waves and sends them to an amplifier, which makes the ultrasonic sound waves audible. Absence or faintness of these sounds may indicate an obstruction to the blood flow. computed tomography scan (also called a CT or CAT scan) : - a diagnostic imaging procedure that uses a combination of x-rays and computer technology to produce cross-sectional images (often called slices), both horizontally and vertically, of the body. A CT scan shows detailed images of any part of the body, including the bones, muscles, fat, and organs. CT scans are more detailed than general x-rays. A CT scan can show the diameter of the thoracic aorta and reveal aneurysms. magnetic resonance imaging (MRI) : - a diagnostic procedure that uses a combination of large magnets, radiofrequencies, and a computer to produce detailed images of organs and structures within the body. Carotid stenting is a minimally invasive procedure involving a small incision in the groin, where a basket and stent are inserted and guided up to the carotid artery for treatment. First, a basket is inserted and positioned inside the artery, past the site of the stenosis. The basket is there to collect any particles that may break off from the stenosis during the procedure. After the basket is in place, the stent is guided up to the site of the stenosis and is opened up and secured against the walls of the artery with a small balloon. The basket is then removed. Patients are awake during this procedure and only need local anesthesia for the groin incision. Patients usually stay one night in the hospital for observation only, and typically find themselves returning to their regular, daily activities upon their return home. A carotid endarterectomy is an open, surgical procedure used to remove plaque and clots from the carotid arteries. The procedure involves making an incision in the neck to access the carotid artery, clamping both sides of the artery to isolate the site of the stenosis and to prevent blood from flowing through the artery, opening the artery to reveal the plaque, cleaning out the plaque, and sealing up the incision with a patch. 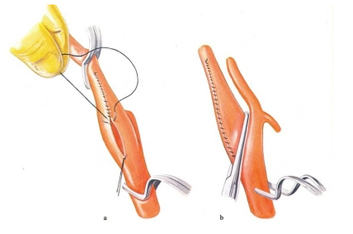 Steps in the endarterectomy procedure are shown in the following pictures. This same procedure can be used to treat peripheral artery disease.